Two pages of sea kayak accessories, from "really useful" to "you must be joking". 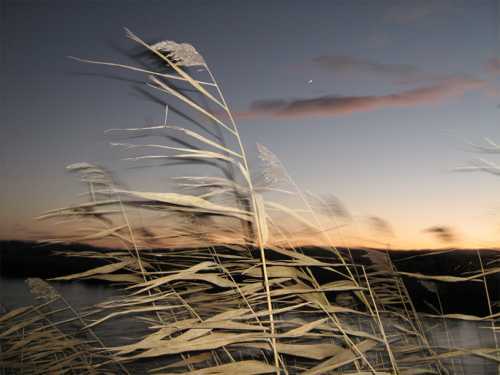 Reeds in an estuary at nightfall, photo courtesy of Orsolya Hetey. This is usually a plastic semi-cylinder, fixed underneath the front deck of the kayak between the kayaker's knees. It is typically about 18 inches long, 6 inches wide and 6 inches deep. The box in the photo is oblong to give extra storage space and its interior is completely sealed off from the cockpit. Access is through a fourth hatch in the deck. The owner has covered the lower half of the box with black self-adhesive foam for comfort. A knee box gives you a dry place to keep small objects you may want during the day, and acts as a useful knee brace for rolling in difficult conditions. Without adding much weight, it stiffens and strengthens the front deck of the kayak, enabling it to withstand the crushing weight of some deep-water rescues. The downside is that it keeps the kayaker's knees apart, which would be unacceptable if you do long expeditions and want to paddle with your knees together as in a flat-water racing kayak. You can easily add a knee tube to a fiberglass kayak. Make the tube of two layers of medium-weight CSM fiberglass reinforcement, wetted out with up to about half a liter of polyester resin. In general, see How To Add Accessories To A Kayak. You can use the inside of an 18 inch length of vinyl rain gutter as a temporary concave mold. Having fabricated your knee tube, clean and roughen the underside of the kayak's deck with abrasive paper, and use fiberglass tape and resin to fix the tube into place and close off the front end. To make a really nice job, get some thin self-adhesive plastic foam from a kayak store and use it to cover those parts of the knee tube which may come into contact with your legs. It is a good idea to have some way of closing off the open end temporarily. For example, a piece of elastic shock-cord stretched across the other end. Then if you go for an accidental swim you won't lose things. 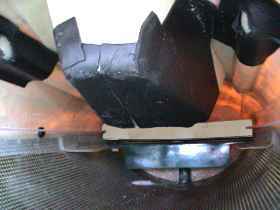 A pod is a separate plastic molding which combines the function of seat, cockpit coaming and bulkheads. It greatly reduces the amount of water that can enter the cockpit if the sprayskirt comes off at sea. A good, comfortable pod is hard to design and few manufacturers have tried. Neither bulkheads nor a pod are enough on their own, because the hull could still flood through a leak (including a leak through the pod-hull joint), leaving the kayak uncontrollable or sinking. We recommend positive foam flotation within the hull. See Additional Flotation For Your Kayak. Surprisingly few sea kayaks are sold with pods. The Puffin from Canadian company Nimbus is available with a pod as an optional extra. Are other manufacturers put off by the fear that there might be patent issues? Many years ago, Alan Byde produced a mold for a pod which could be fitted to most kayaks including his own Sea Tiger. He registered a UK patent for a kayak cockpit liner. He tells us it was a long story but his application "was busted 1987". There's a very useful article with downloadable documentation on the Windslicer website. The link is here. Some manufacturers have tried fitting a "semi pod" by bonding a combined cockpit coaming/ suspended seat unit to the hull all the way round the back, making the back of the seat into a bulkhead. It looks like a very good idea because it excludes an additional 10 or 20 liters of water from the cockpit. Paul Caffyn tells us that "all Kiwi fiberglass sea kayaks built today have the seat built in as a third bulkhead, which forms a day hatch compartment behind the seat. Minimizes the amount of water entering the cockpit in the event of a capsize." Another possibility is to make the hull fully watertight and have the seat molded into the top of the hull (just like a racing ski or wave ski) but with a separate cockpit unit attached to the deck. This usually provides a watertight cockpit with sprayskirt and knee grips but if flooded, you can empty it by unscrewing a drain plug. A South African kayak, the Kaskazi Skua, is built this way. You can unbolt the deck for sit-on-top kayaking in summer. Folding kayaks and traditional skin-on-frame kayaks rarely have fabric bulkheads and are never fitted with a rigid cockpit pod, but they can have the same thing made of waterproof fabric. A sea sock is a large waterproof bag of breathable fabric, permanently attached inside the cockpit. The top is shaped and elasticated so that it attaches to the cockpit coaming in the same way as a sprayskirt, and the kayaker sits inside it. No more than 10 gallons of water can enter the kayak through the cockpit. Unless the sea sock pops off the cockpit coaming the way sprayskirts sometimes do. Sea socks also keep out salt, mud and sand, which may cause damage to a kayak with aluminum joints or a fabric skin. A sea sock must be designed and fitted with care to avoid the risk that it may trap a kayaker who is attempting to get out of his boat under water. Another potential problem is that equipment stowed inside the kayak may slide around if the kayak has to be emptied out in deep water, moving into the cockpit area so that the rescued kayaker can't easily get back in.